For those special events, from fun & relaxing Beach BBQs to elegant Gala Functions in an Island Greathouse or Private Villas. 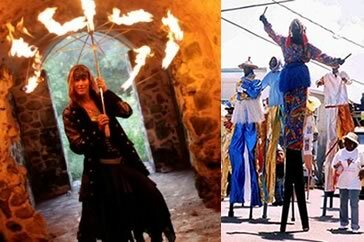 Carnival & Tropical themes, Pirates to Black Tie, we know how to throw a party in the islands. One of the original Island Plantations, which in former times has also been a private estate and corporate retreat, is now one of the most beautiful locations for private group events. Breathtaking views, gourmet menus, excellent service, are the hallmarks for an unforgettable event. Suitable for an elegant formal occasion or fun relaxed party. For a memorable cocktail party in a historic setting - two different locations to choose from. Step back in time at Blackbeard's Castle with spectacular views of Charlotte Amalie town and harbor. It also has the world's largest collection of copper & bronze life-size Pirate sculptures, and a lookout tower. 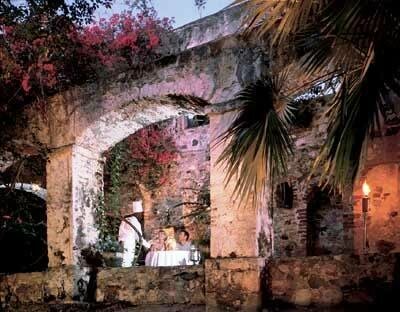 The Amber Museum and the spectacular Amber Waterfall and historic Hotel 1829 are a second location available in the Blackbeard's Castle complex. Don't miss the Dinosaur footprint in amber! 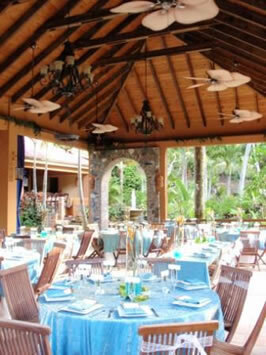 A unique venue for a larger group function - dine in the shade of a palm tree grove. For select smaller groups, marvel at being embraced 360 degrees by a natural reef created in an 80,000-gallon exhibit - the Caribbean Reef Encounter. Knowledgeable aquarists will be your guides for the evening while you explore the wonders of the tropical seas. 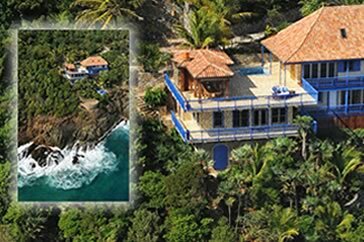 Located on St. John, this exclusive retreat of the rich and famous has four exquisite options for group events. The Equator Restaurant is in a converted Sugar Mill, for a tropical Plantation style then chose the Turtle Bay House or Verandah. Finally for a very unique setting for a smaller group, then it has to be in the historical "Ruins". The resort has a reputation for impeccable quality and service, matched only by its superb location in lush tropical grounds, dotted with picturesque historical ruins and seven pristine beaches. Offer another wonderful option - a step into a magical world of tropical vistas and Caribbean charm. Gourmet dining in some of the most exclusive locations on the islands, not usually available to the public. Really let them know you appreciate them by treating them to something special - a private dinner at a private villa. Guests kick off their shoes, step on board and relax in good company, with light snacks (upgrades available) and a very open bar. They will enjoy the warm gentle breezes and the glorious Caribbean sunsets as a finale to a fun day of group activities or as a prelude to going out to dinner. This is an option for smaller groups to share a relaxed evening together while experiencing some of the best the Caribbean has to offer. They will relax as the turquoise waters turn to indigo as the sun dips behind a chain of islands while indulging in fine food and wines with no fuss of dressing for dinner. Choose from a wide selection of restaurants, all with their own unique blend of great food and diverse island locations. Have the entire restaurant exclusively for your group or select a number of different restaurants so your guests can take advantage of the variety available. Dine-arounds with pre-set menus are available for groups. 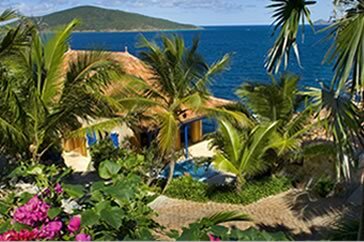 Overlooking picturesque Loveland Bay on St. Thomas, Norbu is a majestic and private waterfront venue providing a full array of first-class services for intimate events. From the moment you enter the stone pillars, your unforgettable journey begins. 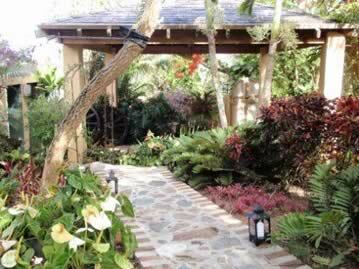 The villa is nestled at the edge of world famous Devil's Triangle and is surrounded by a lush garden. Exotic tropical hard woods, vivid glass tiles and original Caribbean and Indo-Chinese art all contribute to the home's nostalgic and aesthetically refreshing charm. Thrill your guests as they experience the tantalizing allure of the tropics. Enjoy a poolside cocktail party, watching the golden sunset turn into a breathtaking cascade of evening stars or explore the mystique of the Tropical Gardens and the Majestic Waterfall. Nature is ablaze with vibrant color and the verdant foliage is everywhere along with a stunning palette of blooms. We think you'll agree that dinning with nature in the tropics opens a world of sensual experiences and will provide the perfect setting to transform your special event into one that is truly spectacular. Choose from a wide selection of restaurants, all with their own unique blend of great food and diverse island locations. Have the entire restaurant exclusively for your group or select a number of different restaurants so your guests can take advantage of the variety available. Dine-arounds with pre-set menus are also available for groups. Listed below (alphabetically) are just a selection of the fine restaurants located on St. Thomas. Enjoy a taste of Spain in the Caribbean! Amalia Cafe is a delightful open-air restaurant owned and operated by Randolph and Helga Maynard. Located in the cobblestone Palm Passage, this Spanish meson serves a varied selection of Spanish favorites and augmented by daily tapa and entrée specials. Maynard and his staff of chefs ensure an excellent dining experience with upscale, authentic Spanish cuisine, using only the freshest herbs and ingredients available. 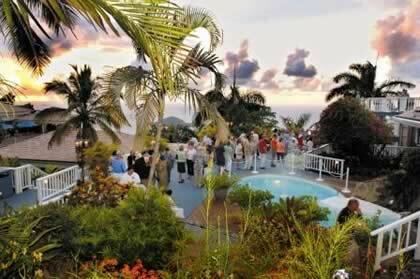 Located at Bluebeard's Castle Hotel with an excellent view of the town and harbor of Charlotte Amalie. The ambience is informal, welcoming and relaxing. 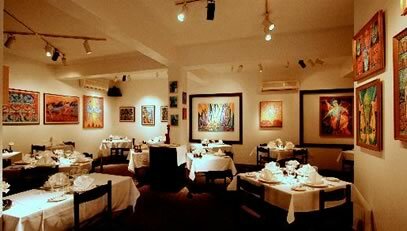 Where the philosophy is "A restaurant should be a place for family and friends to gather for luscious food and celebration. Where wine and chocolate abound, how could one not be happy!" And the chef's passion for Italian and Mediterranean fare, a pinch of the tropics, a hint of Asia, lobster, seafood or beef, his international cuisine is as luscious as it is beautiful! International cuisine with an emphasis on Austrian dishes and the sunny flavors of the Mediterranean lend itself to an intimate dining experience. 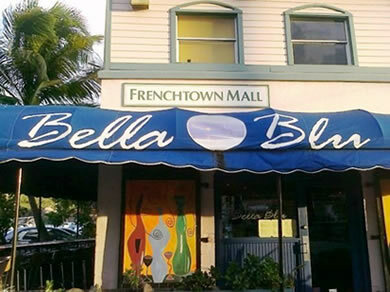 Located in Frenchtown, every month Bella Blu showcases the works of a new artist. Enjoy a wonderful dining experience, with fabulous food surrounded by the work of the most up and coming artists in St. Thomas. The Cellar is the perfect place to unwind in a warm and cozy, yet modern atmosphere. The serene interior features a copper tin ceiling, a relaxing waterfall and a dramatically lit bar. Specializing in a progressive American seafood cuisine, daily fresh seafood features, beef wellington and truffle macaroni & cheese. The food and wine pairing destination of the Caribbean. Located in Red Hook. Sophisticated wine bar and restaurant, waterfront location at Yacht Haven Grande, featuring exquisite small and large plate courses, each expertly paired with wines by the sommelier, mixologist martinis & cocktails, and tropical cuisine with a Mediterranean flair. Grande Cru wine bar and restaurant offers a refined, upscale experience in a casually chic setting. Dine in air-conditioned comfort or outdoors. "Tropical serenity meets cutting edge chic" is how Havana Blue owners describe their restaurant overlooking Morningstar Beach. The stunning décor features an eclectic mix of New York, South Beach and the Caribbean style to create a hip, yet approachable vibe. The restaurant's cuisine combines authentic Cuban and Latin dishes with exotic spices and tangy sauces from the Pacific Rim. All of this, combined with the restaurant's oceanfront location, creates a culinary experience unlike any other in the Caribbean. Rustic elegance at its best. 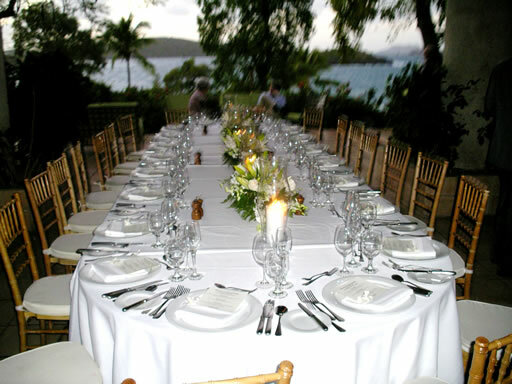 This award winning, fine dining restaurant is uniquely situated in a 200 year old restored plantation field house on St. Thomas' North side. 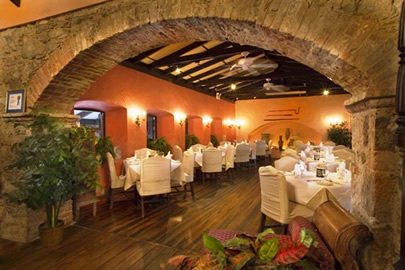 With native stone walls, hardwood floors, beautiful brick archways, and a palm-lined courtyard, The Old Stone Farmhouse is one of the most romantic and elegant restaurants in the Caribbean. Featuring seafood, steakhouse and vegetarian menus inspired by French technique and local Caribbean ingredients. Steaks are hand cut to order- size specified by the guest. The island's local fish (snapper, wahoo, mahi mahi, grouper, live lobster) are always in house! Guests may select their meat and fish in the kitchen. 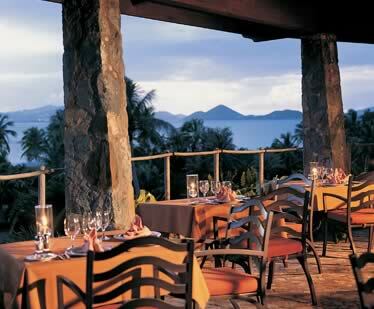 On the water's edge with breathtaking view, Oceana has become one of St. Thomas's premier restaurants. 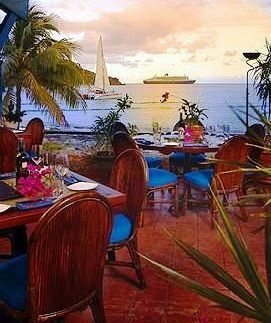 Dine in an atmosphere of island elegance and romance. Savor the Innovative Global Cuisine created by renowned executive chef Patricia LaCorte and her expert culinary staff. The extensive wine list offers 200 selections. An extraordinary dining experience with impeccable service and food. Chef, owner and artist, Tony Romano has been serving fine Northern Italian and Continental cuisine since 1988. People instinctively know on entering Romano's they have found one of those rare restaurants where cuisine, service and ambiance were designed to delight all of one's senses. The décor encompasses whimsical, brightly colored paintings by Tony Romano. 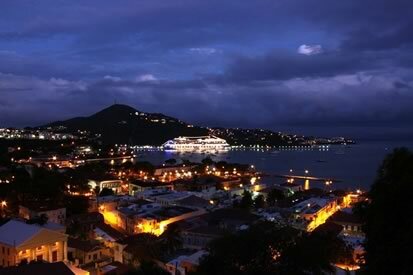 Overlooking Charlotte Amalie town and harbor, located at Bluebeard's Castle. You will be mesmerized by the panoramic views in this intimate restaurant. Sunsets to twinkling lights of downtown sparkle from each window. The menu is fresh seafood, steaks or pasta-but leave room for the desserts like Banana Mango Flambé or Flourless Chocolate Mousse Cake. Room with a View has, for several years in a row been awarded the Wine Spectator Award of Excellence. A jewel in the heart of Charlotte Amalie. The fare is Northern Italian in style, with subtle seasonings and exquisite presentations. Pasta comes in dozens of varieties, with the seafood and linguine a delight. A dining experience not to be missed. Choose from a wide selection of restaurants, all with their own unique blend of great food and diverse island locations. Have the entire restaurant exclusively for your group or select a number of different restaurants so your guests can take advantage of the variety available. Dine-arounds with pre-set menus are also available for groups. 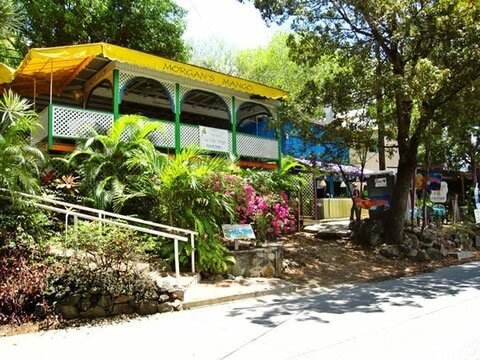 Listed below (alphabetically) are just some of the fine restaurants located on St. John. 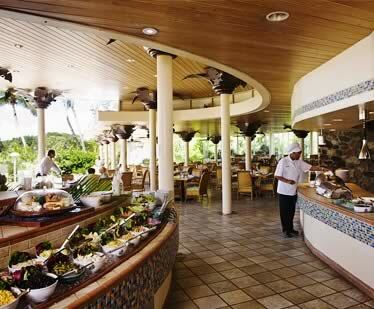 Sumptuous lunch buffets are available at the Caneel Beach Terrace. 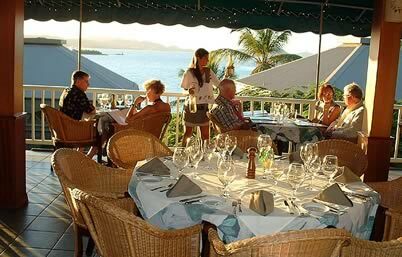 This open-air dining room located just a few steps from the Caneel Bay shoreline. 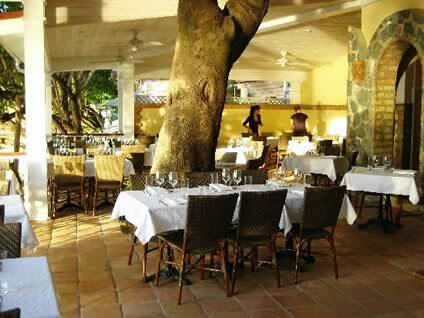 **Days and hours of operation of the resort's dining venues vary according to season. 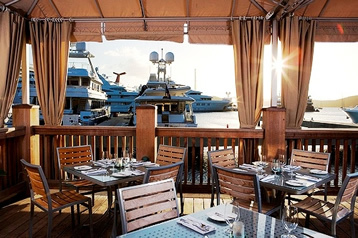 Caribbean steak and seafood restaurant featuring prime, grass fed steaks, and domestic lamb. Cruz Bay Prime also dishes up only the finest fresh local sustainable lobster and seafood, with a dynamic full dinner menu that changes daily. A full cocktail and wine list, a delicious bar menu, and live entertainment on Fridays and Saturdays make this upscale and chic spot the perfect place to relax and unwind with great food, high quality spirits, and uplifting music. Located at The Westin Resort. High atop the resort's 18th-century sugar mill ruins, overlooking Caneel Bay with St. Thomas on the horizon, the Equator Restaurant features delicacies of the Caribbean Islands. The resort's executive chef has created dishes that introduce guests to the herbs, spices and natural resources native to St. John and the Virgin Islands. 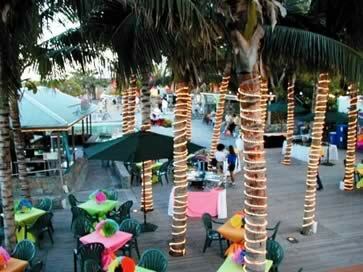 **Days and hours of operation of the resort's dining venues vary according to season. The Fish Trap is quintessential Cruz Bay. 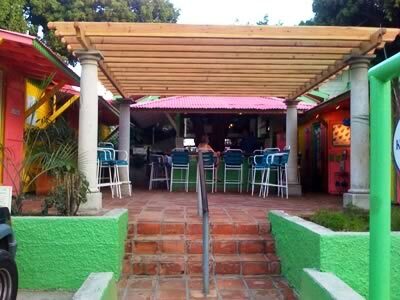 A casual, comfortable, covered patio setting allows you to enjoy the outdoors and cool tropical breezes while you dine, or you can eat in the air-conditioned bar with its mahogany wood bar and hand painted tiles, unique works of art on the walls. Under owner and Chef Aaron's management, the Fish Trap Restaurant won multiple awards for the best seafood, and he himself walked away with yearly "Best Chef" awards. Specialty Fresh Fish Daily - also serving steak and pasta dishes. The Lime Inn is one of St. John's longest continually running restaurants. Established in 1984 by proprietors Rich and Chris Meyer, who continue to own and operate it to this day and a perennial favorite among locals and visitors alike. The Lime Inn specializes in fresh local seafood such as lobster, snapper, tuna and mahi-mahi, served in a casual open air atmosphere. There is also plenty for the land lovers as well, featuring filet mignon stuffed with your choice of crab meat, Brie Cheese, or Blue Cheese, along with daily specials including chicken and pasta dishes. Daily specials include chicken and pasta dishes. At Morgan's Mango, they reflect the life of the islands, a place of dazzling light and color, tropical breezes and starry nights, a relaxed and sensory experience. You will share in the culinary history of an island world crowded with so many wonderful cultures that it takes your breath away, an incredible melting pot of ethnic and classic cuisines. A neo-Caribbean experience conveying the juice and jazz of the islands, a carnival of flavors and lifestyles. Contemporary cuisine with a fresh tropical flair. 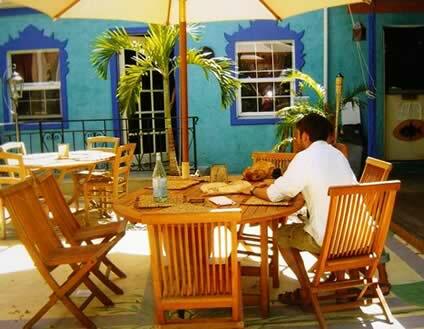 Upscale California cuisine with island flavor in an open air courtyard in Mongoose Junction, downtown Cruz Bay. 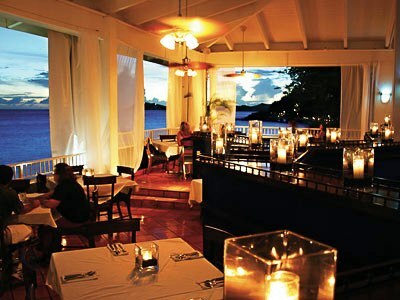 Located in the heart of Cruz Bay, encompasses the flavors of the Caribbean as well as Pacific Rim & Tropical cuisines. Dine in a tropical garden courtyard reminiscent of a well-appointed home in the South Seas, offering outdoor dining in the glow of bamboo torches and dining on cozy pillow covered bench seating "livingroom" Inspired cuisine in an atmosphere of rustic elegance. Located at the northern end of Caneel's peninsula, the Turtle Bay Estate House is the resort's most elegant restaurant, offering traditional dinner favorites along with nightly specials. The intimate atmosphere at Turtle Bay creates a romantic setting. The cuisine is classical and creative American with a steakhouse-inspired theme. **Days and hours of operation of the resort's dining venues vary according to season. 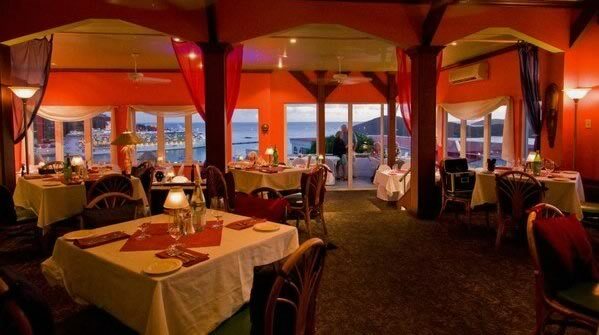 St. John Waterfront Bistro is located as the name states on the waterfront on Cruz Bay beach. 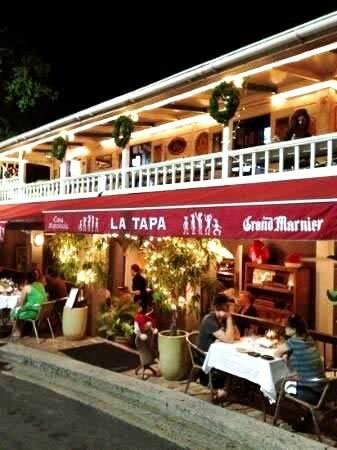 This elegant restaurant features classic French cuisine with Caribbean flare dishes. Enjoy the phenomenal view and beautiful sunsets. 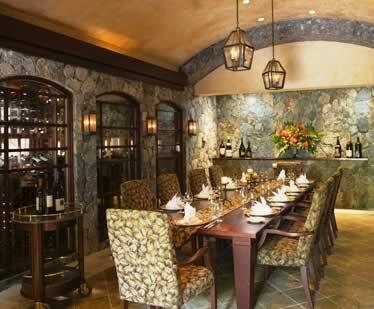 The Wine Room, located within the walls of an 18th-century plantation house, seats up to 10 for private dinners. 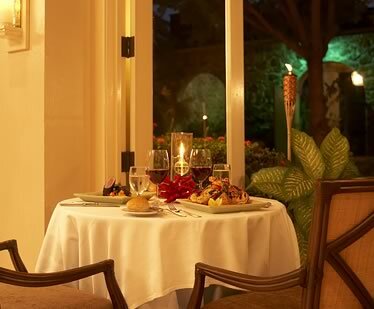 A prix-fixe, seven-course menu, carefully selected to highlight selections from Caneel's wine collection, is offered. The wine list is comprised of 265 selections to complement wine tastings and pairing dinners. The Caribbean's only fully operational, temperature-controlled wine room boasts over 1,000 bottles of wine. Open for dinner all week in winter and four nights in fall, spring and summer. **Days and hours of operation of the resort's dining venues vary according to season. Consistently garnering rave reviews, Zozo's offer a menu that changes four to five times a year depending on the availability of seasonal local items. As you sit at Jaxs Lounge and sip a cocktail, you will witness a beautiful Caribbean sunset as the sun dips into the tranquil blue waters of the Caribbean. Named "First Choice for Where to Dine in the VI by Travel and Leisure Magazine watch as the sparkling lights of St. Thomas slowly appear. Serving exquisite classic Italian dishes like Lobster Mezzalune or their signature dish Osso Bucco your dining experience is one not to be forgotten. 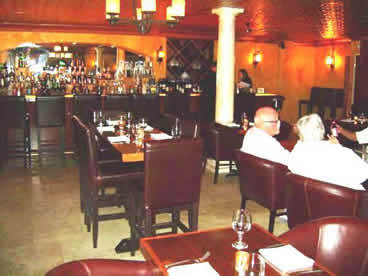 Zozo's specializes in finding those hard to get wines and offers them at an outstanding value. Located at Gallow's Point. 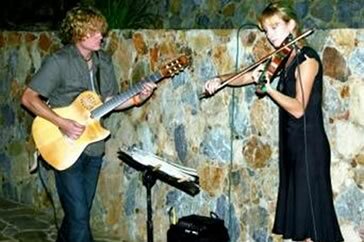 The Virgin Islands has a wealth of talented musicians and performers waiting to entertain you. Get into a tropical beat with Steel Pans or a Calypso band, kick up your heels with Reggae, Rock or Oldies bands. 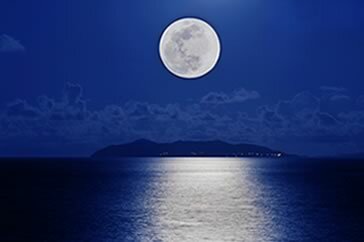 Relax with soothing Jazz, Classical Strings, Classical Guitar or the elegance of a Harp. We have something to suit every occasion. 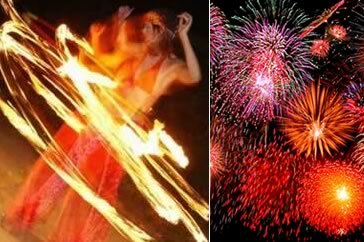 Experience a Caribbean Carnival - spice up your party or corporate event with those amazing stilt dancers (Mocko Jumbies) in brightly colored costumes, electrifying Limbo Dancers, spectacular Fire Eaters and Broken Glass Walkers. Fireworks in the Tropics! Light up your events with pyrotechnics and add sparkle to any evening.